After Mr. Craftery and I got married in 2009, we moved into a large townhouse in our town. It was a perfectly nice home and we stayed for a number of years until we had our children and started running out of room. One of my favorite things about that house was that every summer, dragonflies would appear from nowhere and buzz all around. I guess it was because our house backed up to a small forest. But the sight of those flittering, fluttering bugs always looked so magical to me! 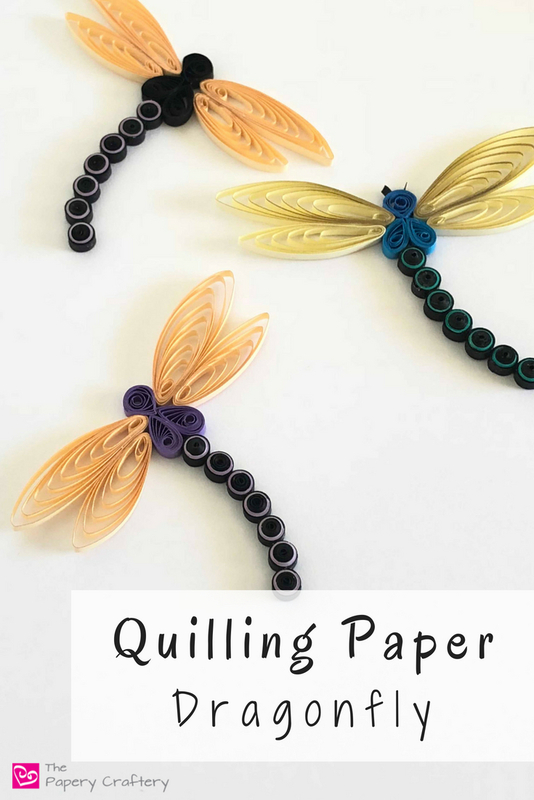 This week, I’m making my own and sharing the steps so you can learn how to make a quilling paper dragonfly, too! To start, grab the paper of your choosing and a couple extra tools. I decided to make the main body of my dragonfly black, but I also wanted the wings to stand out. The rose gold metallic paper from JJ Design is a perfect choice! Also, think about grabbing some clear glue. 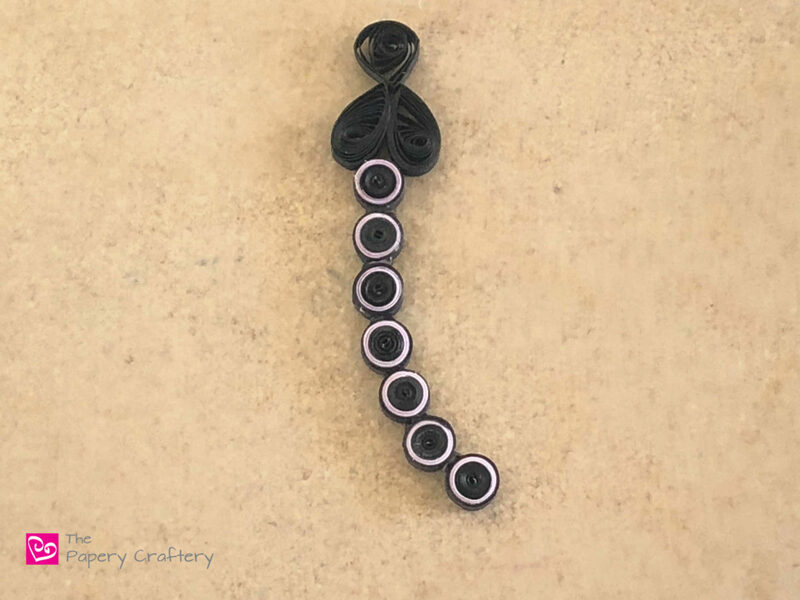 I get much cleaner results and less dried glue-bits when I use clear glue with black quilling paper. Let’s begin with the tail section. 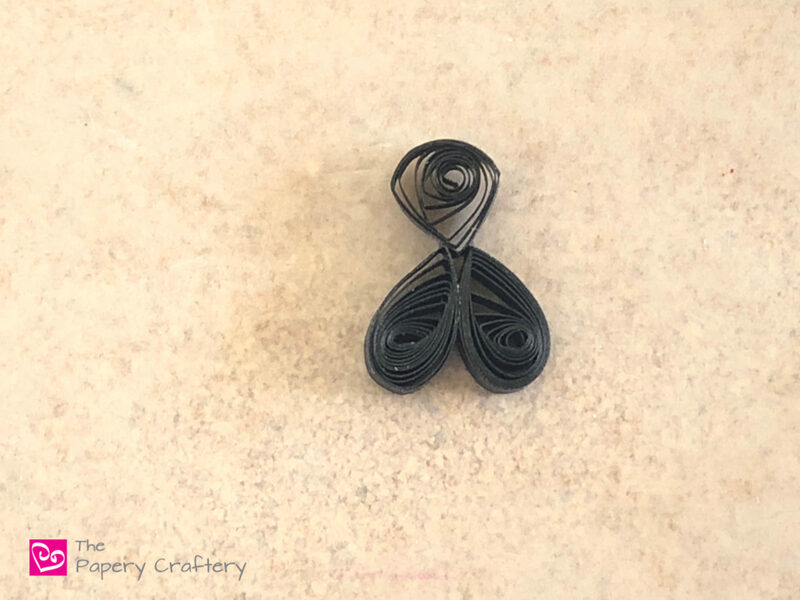 To make this simple, I chose to make my quilling paper dragonfly’s tail from multiple tight black coils. But to make them a little more interesting, I’m adding a ring of bright color. So I measured out 5″ of black paper, 3″ of orchid, and another 2″ of black. Roll the 5″ strip into a tight coil. 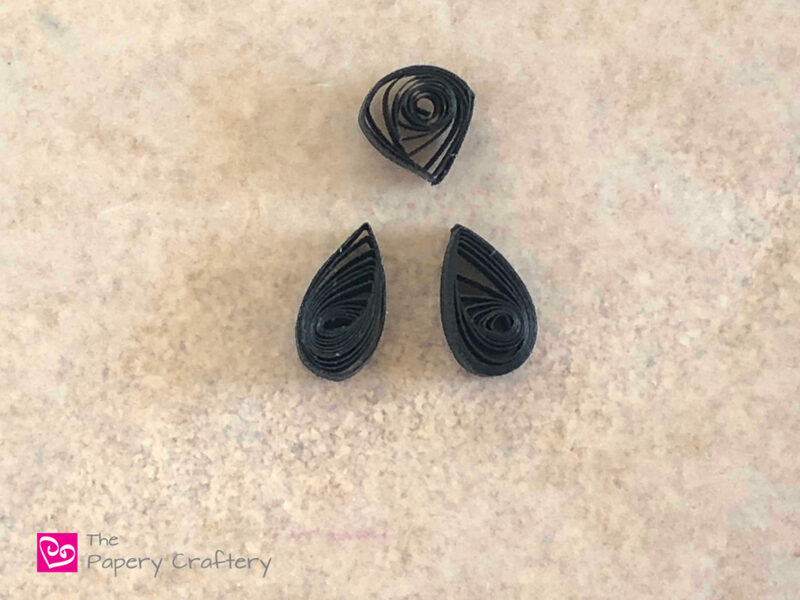 I’m playing with the Savvy Slotted Quilling Tool again for these coils because I’ve found it makes really quick and even quilled shapes. Read my recent review here! 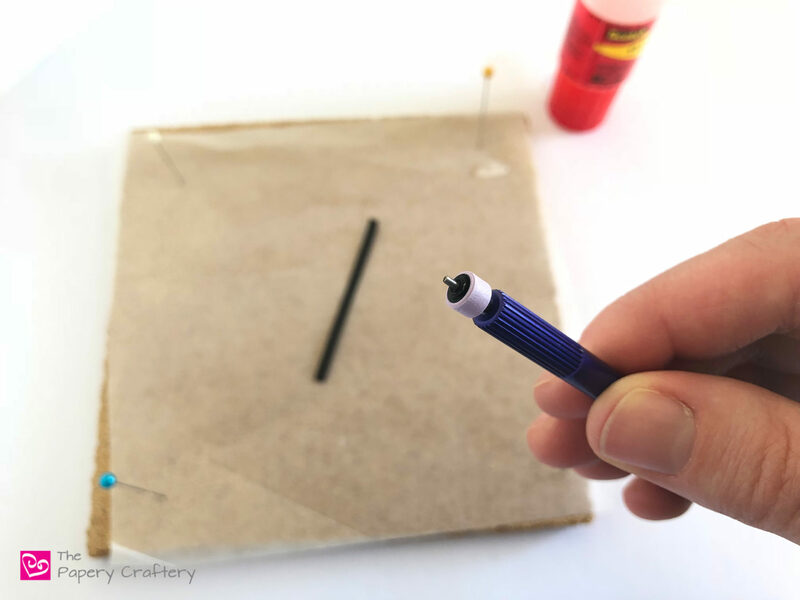 With the black roll still on your tool, glue one end of your bright strip to your coil, and wrap tightly. 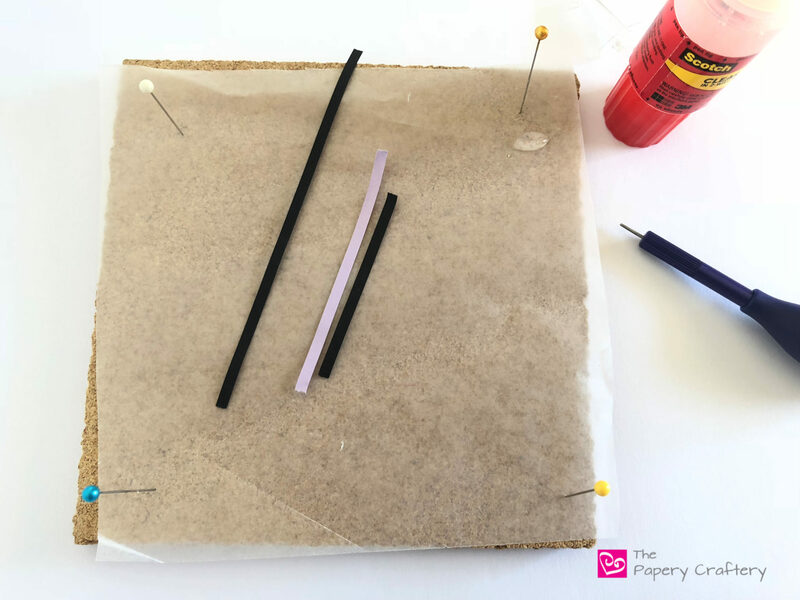 Finish with the shorter black strip, attaching and wrapping the same way as the bright strip. 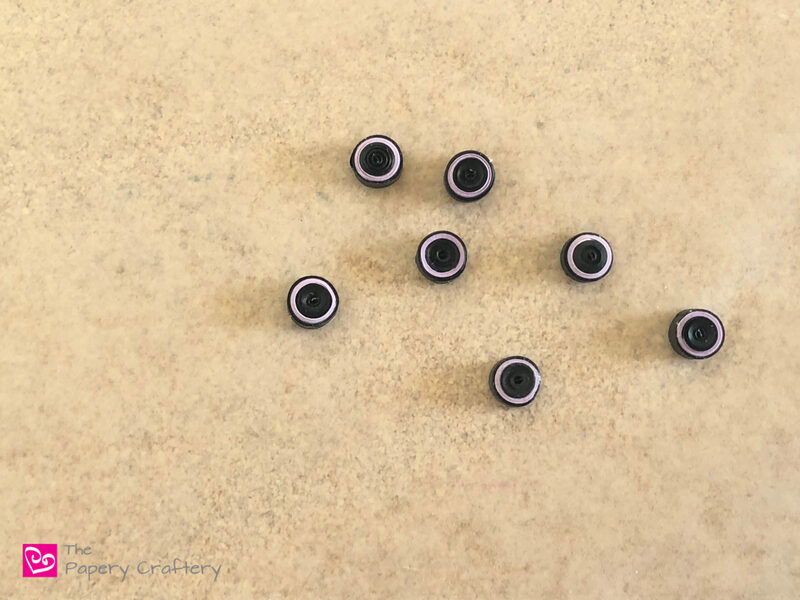 Repeat these steps to make 7 coils. Now for the head and main body of the dragonfly! 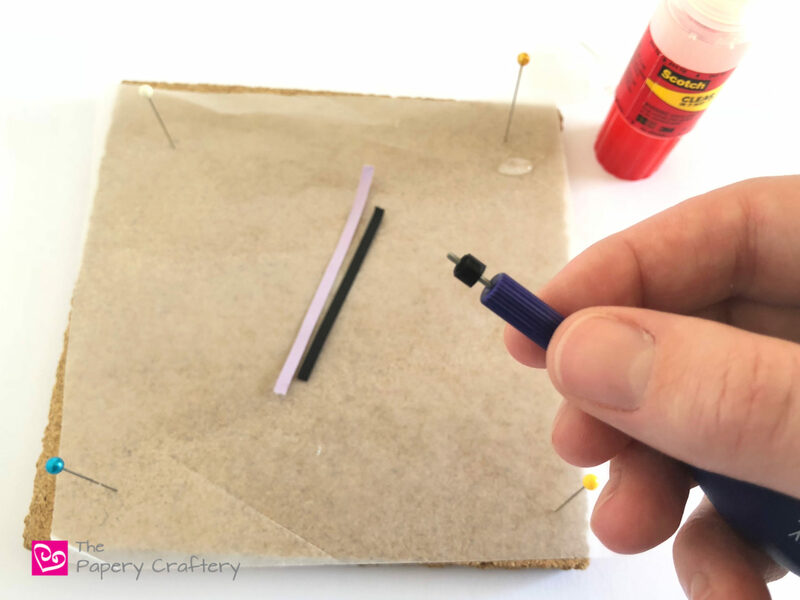 For this part, roll 2 8″ strips and shape into teardrops. 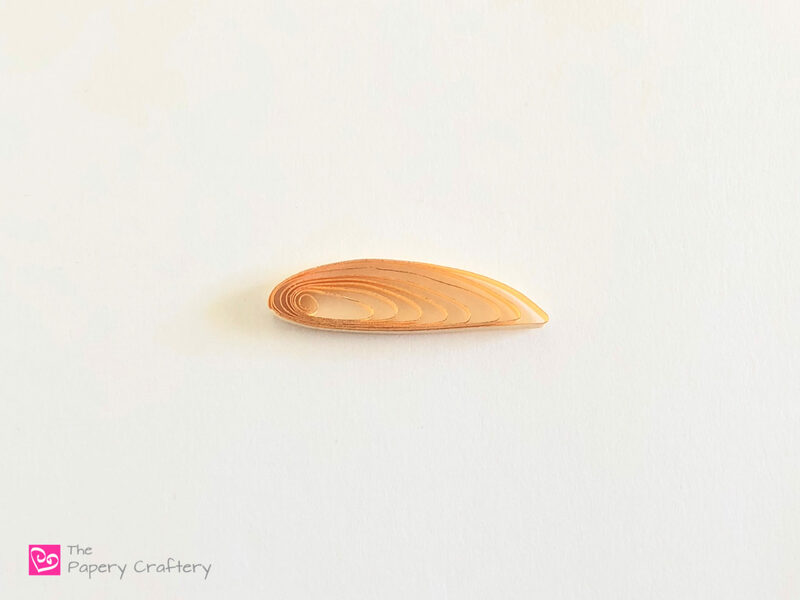 Then, roll a 6″ strip, pinch into another teardrop, but add two other small pinches on the sides for a rounded triangle shape. Tightly glue the two teardrops into an upside-down heart. Add the triangle to the end. 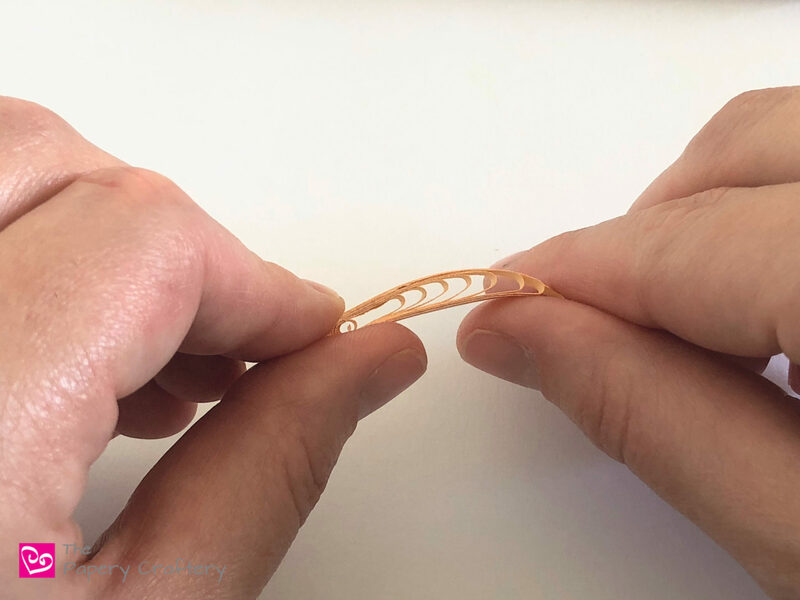 As your head and body dry, glue the 7 coils in a row to make the tail. The tail can be straight or at a slight bend. 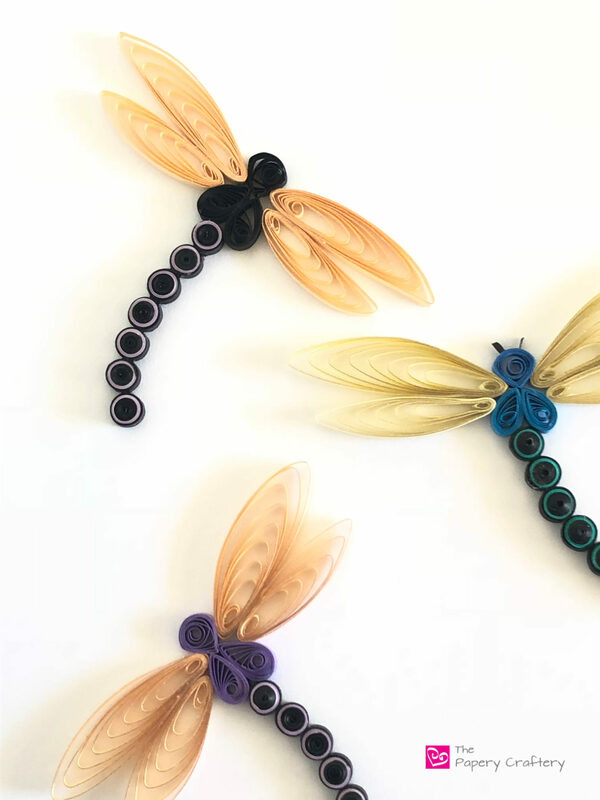 To make the wings appear light and translucent like real dragonfly wings, I reached for my quilling comb. I know, I know. 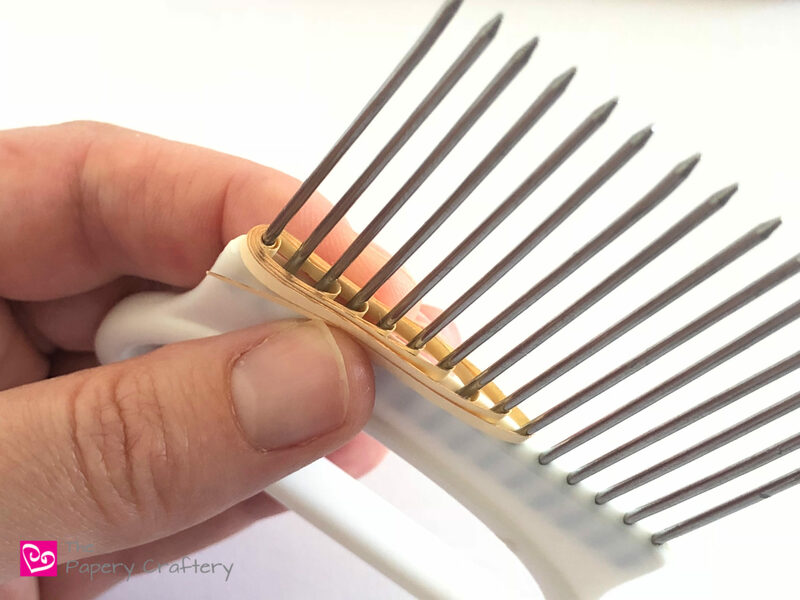 I’ve been bringing out the quilling comb a lot lately, but it’s so versatile! 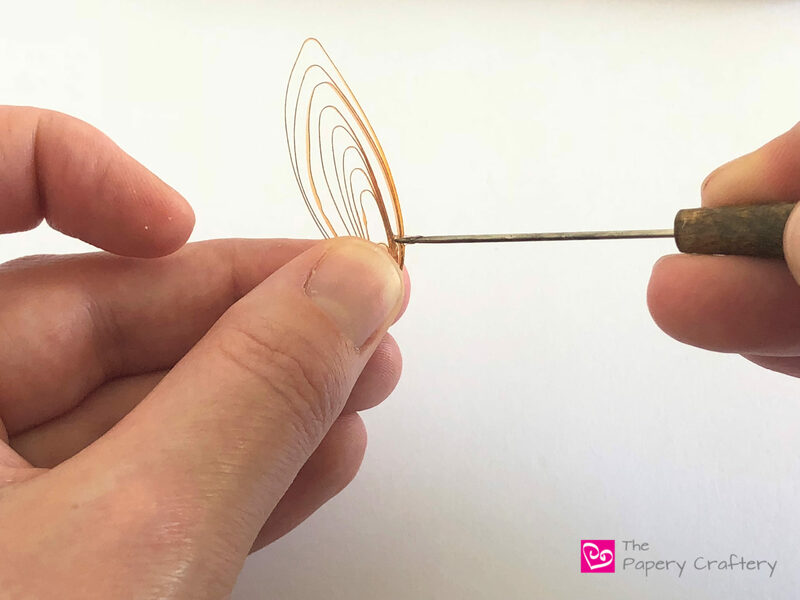 Grab a full strip of metallic quilling paper and roll a couple times on your needle tool to make a small loop. 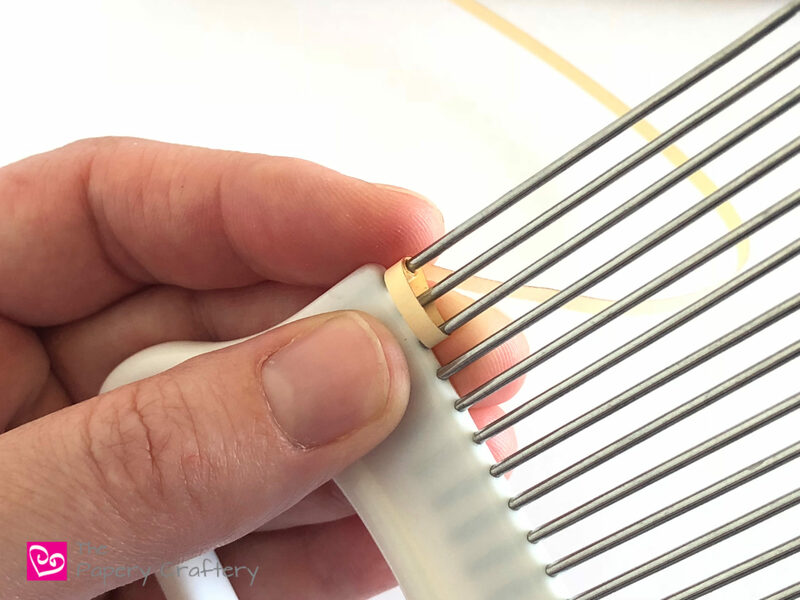 Place this loop on the first tooth of your comb with the tail towards the back. 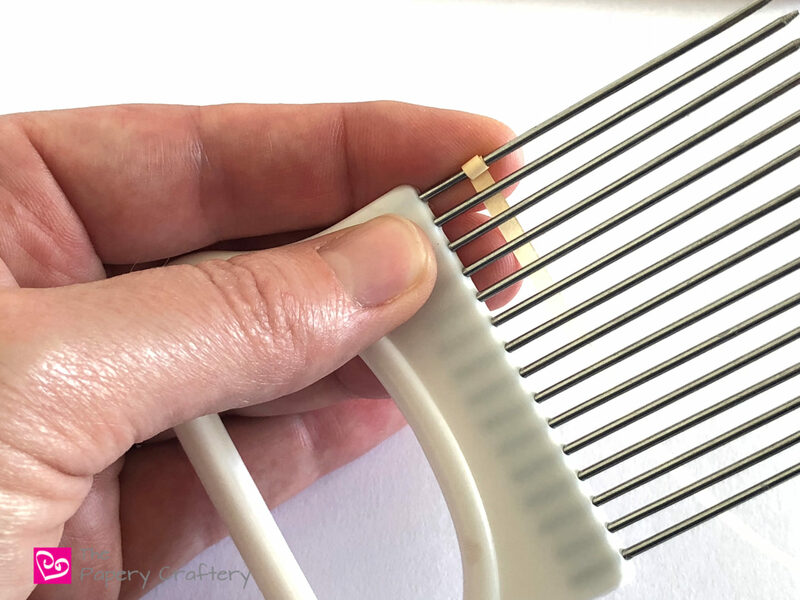 Bring the tail of your strip back to the front at the third post of your comb. Pull the end back up to the top and around the back, making a full circle. 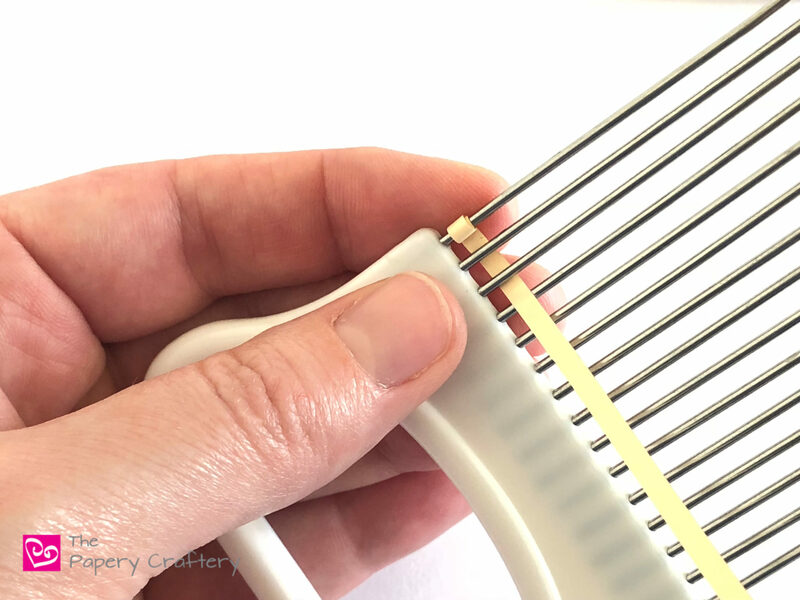 Keep wrapping your metallic strip around your comb in the same way, adding another space on your comb as you go. 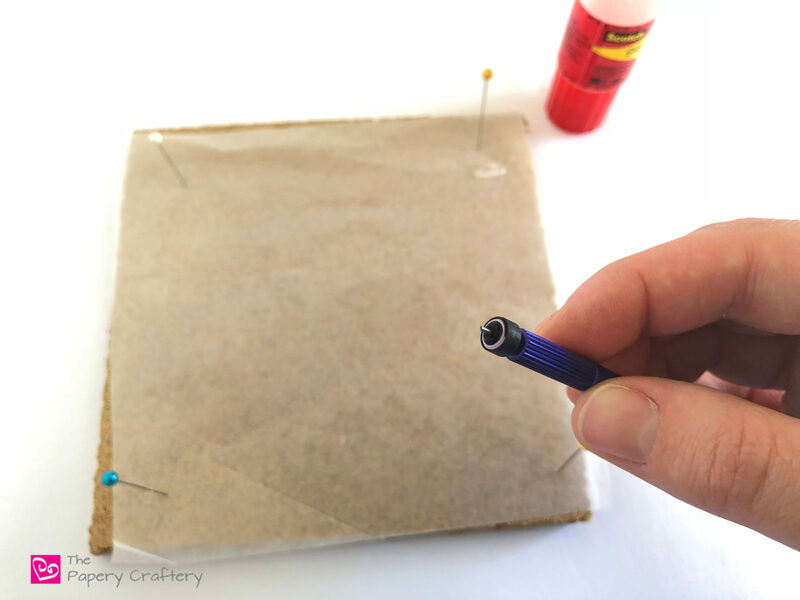 After the eight loop, tear off any extra paper and secure the end using a tiny bit of glue. 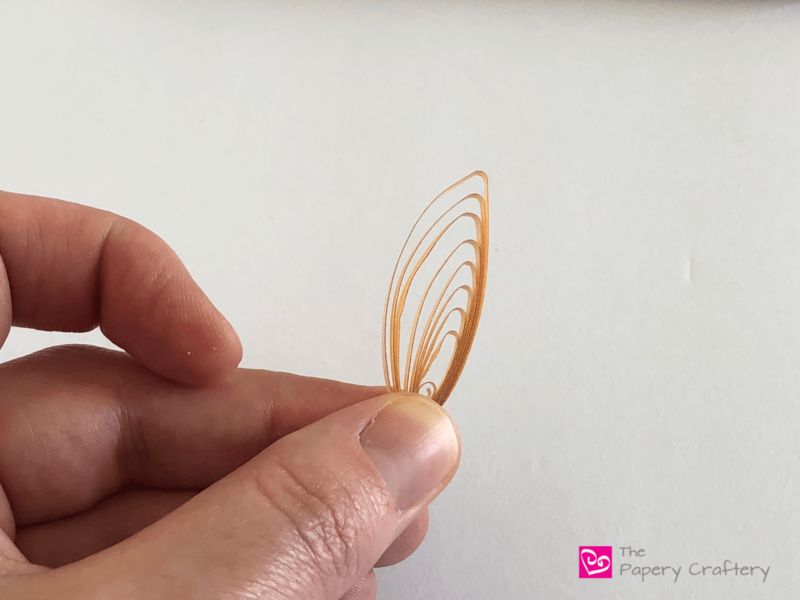 Gently remove from your quilling tool. Your paper should look similar to the photo below. 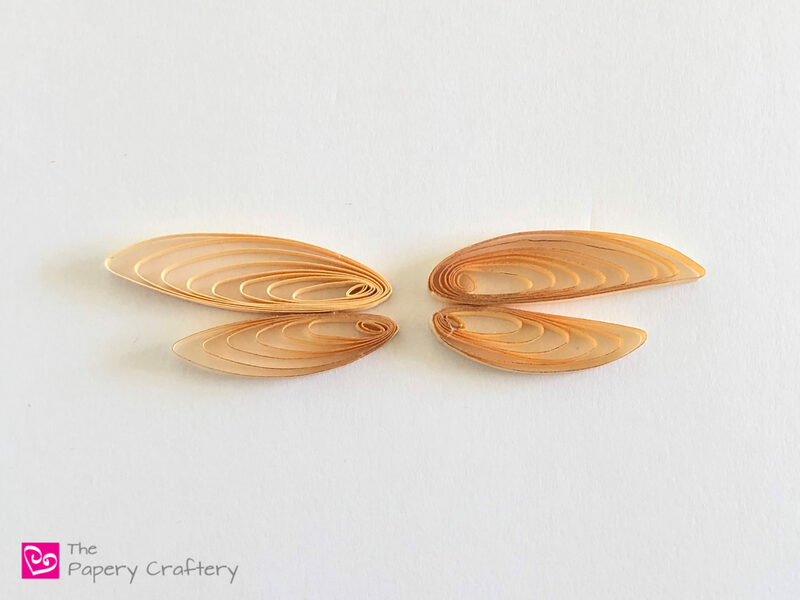 To make these look more wing-like, you’ll need to shape them a bit. I was looking for the wings to have one flat side and the other a little more bowed. 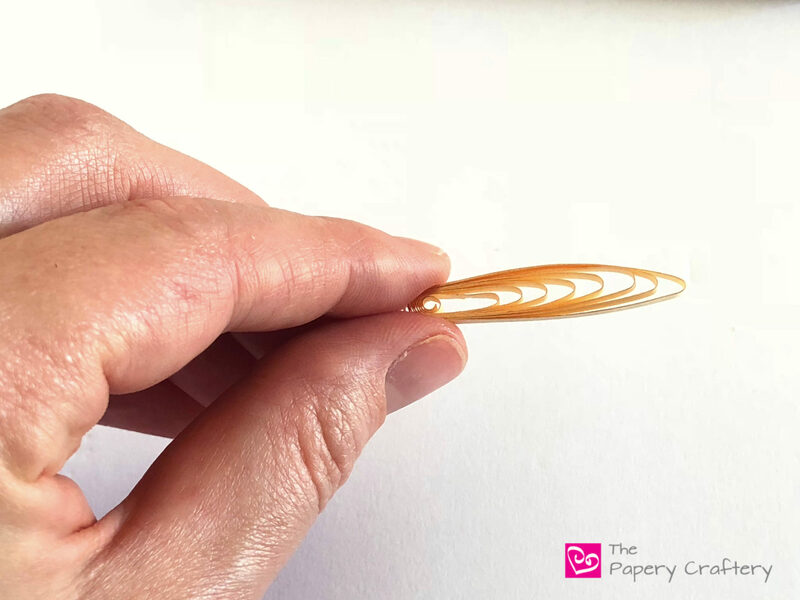 Start by bending your wing gently over your thumbs and pinching the ends slightly. You can see below how the left side of the wing is more domed than the flatter right side. If need be, use your fingers to separate the rounded side. I found it helpful to add a touch of glue between the layers on the flat end. 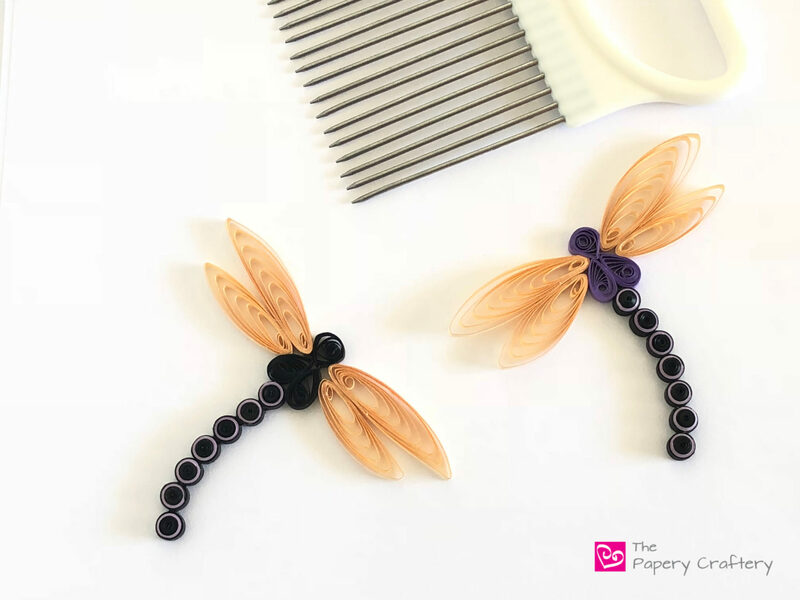 The shape and shine are similar to the glassy look of real dragonfly wings! Make the rest of the wings in the same way. The bottom halves can be made a little smaller. I only wrapped these around 6 teeth on my quilling comb instead of 8. Don’t forget to pay close attention to how you’re bowing your wings. The two sides are mirror images of each other. Glue the wings to your dragonfly body. 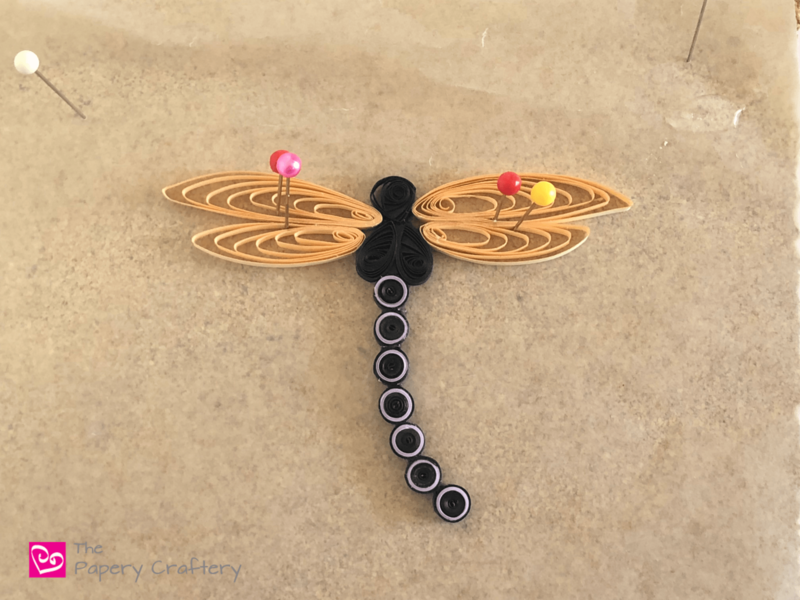 I tried adding some tiny antennae and golden wings to another dragonfly. But I’m not sure how I feel about that. They look ready to take off! 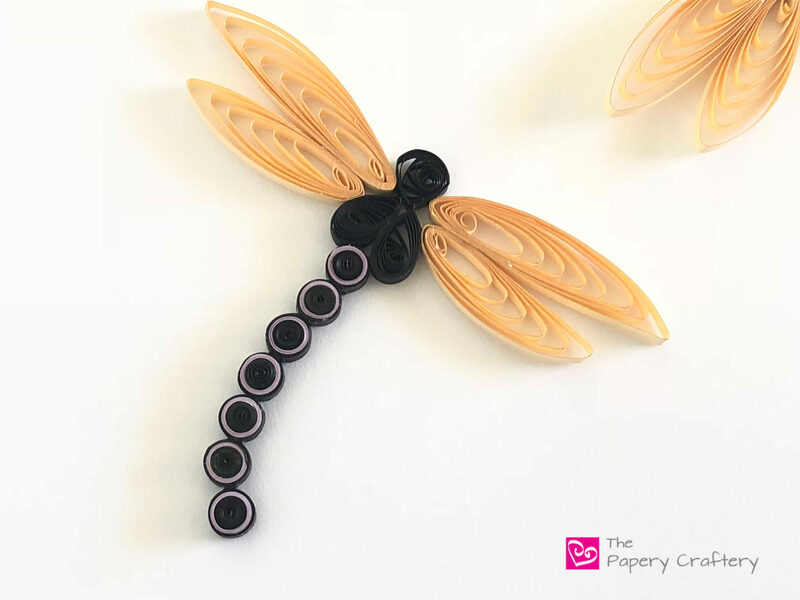 I hope you’re inspired to make some summer crafts once you’ve mastered how to make a quilling paper dragonfly. 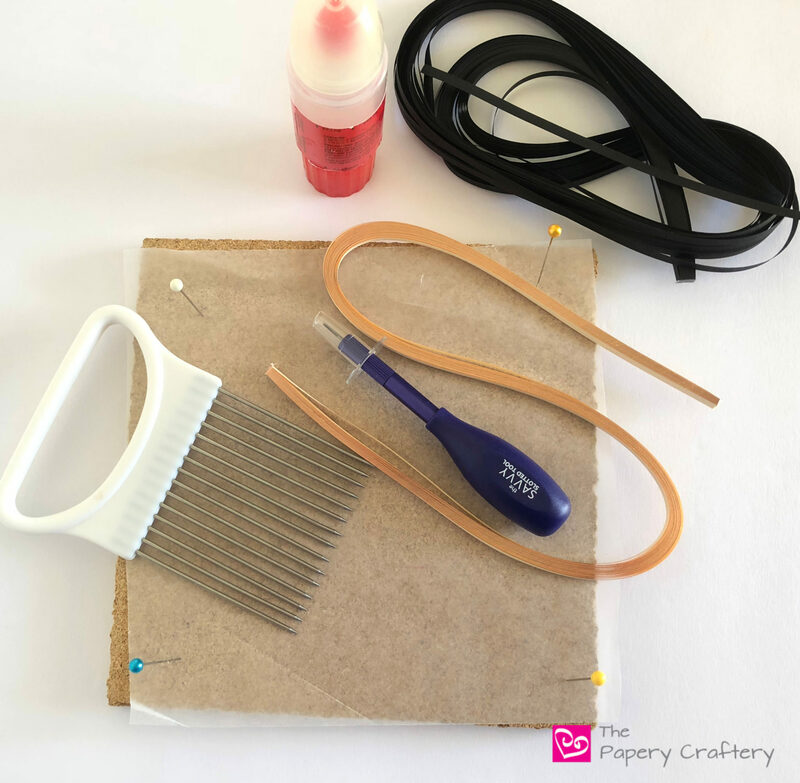 Maybe add some quick quilled grass, since you’ve already got a quilling comb handy. Also a quick note: You may notice fewer posts and tutorials this summer from me. I’m planning on enjoying these next couple months with Moose and the Bean, so I’m going to be aiming for a new post every two weeks. I may add an extra here or there, but we’ll see what happens! 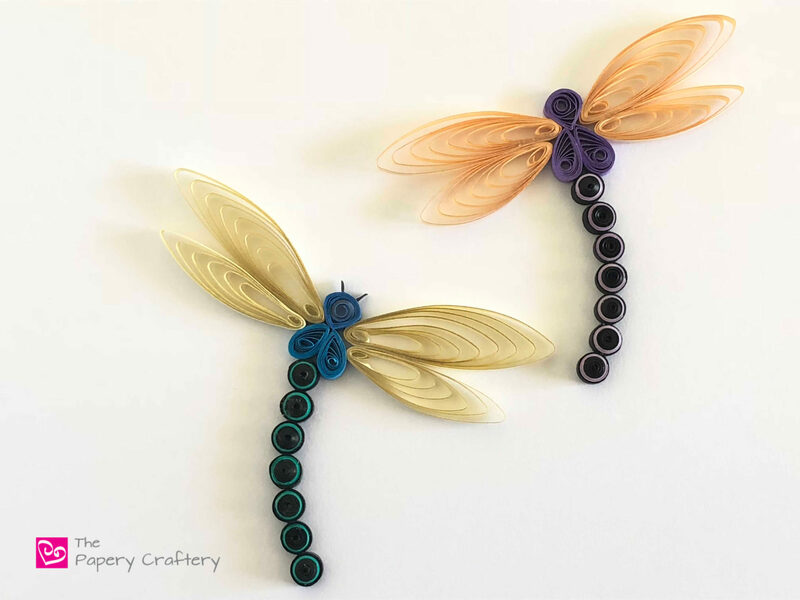 In the meantime, enjoy making these sweet insects! Perfect, Joy! Let me know how it goes! Thank you. Love your clear instructions. You’re very welcome! Thank you for the feedback. Happy crafting! Thanks for understanding, Cindy. I’m still finding it hard to get everything done that I’d like too! Enjoy your summer! That’s so nice to hear! Thank you so much! I’m so glad they’re working out, Sanne! The strips for the body were 8″ long, and the one for the head was 6″. Of course, they can be made smaller if you like that look better! I see. You’re right; I didn’t use a board to measure these coils. I let them open naturally. I’m so glad you’ve found a solution!